There is another post as concerned with security, keeping your online presence secure, fighting with keyloggers, spam and much more. So, I am going to share some security tools and tips for my readers so that they may not fall prey of such criminals and fraudulent activities. Since, With the help of keylogger any hacker can hack into bank acounts of victim. Hardware keylogger - We can detect is easily, As it may be attached to a keyboard or also at the back of the cpu. Your eyes and experience can help you out. 1) He may call his remote keylogger as crack of patch of a software which is not free and thus you will download and will run it, FINISH, It will record and send you all key strokes. Now, what was missing? yes a good spyware of antivirus software. You don't need to spend a peny for it, Hackers thirst will give you some freeware and also patched softwares. 2) He may change the icon of the .exe file ( Romote keylogger) to some kinda image file or video so that you may click it immediately without noticing the extension. And there may be many tricks it depends upon the mind of the attacker. How remote keyloggers send logs? Yes, Its a good question which may be coming in your mind. Well, I have examined many keyloggers personally. We can use two communication methods for getting logs. First is email and second easy option is ftp. Now, It will be clear, that when we make a server or attacking file which will attack other computer remotely if the vicitm opens it, We shall give our ftp login information or a gmail email address (Gmaill suits better for keylogging) for ftp the hacker can get a free t35.com or 110mb.com account or else he can have a personall hosting. The logs will be uploaded to the free hosting via ftp after every second. And vicitm computer will upload it silently. Same is the case with email address. RAT's are more dangerous, I have created couple of posts for RAT,s too. You should read them. Shop, bank, and make travel arrangements online - It will keep you safe from password stealers, keyloggers, spyware, trojans, online fraudsters, identity thieves and other potential cyber criminals. 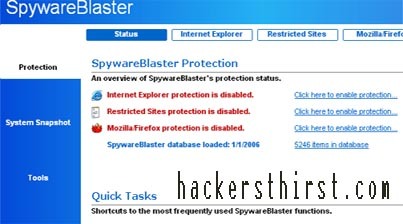 Spyware Blaster - Prevents the installation of ActiveX-based spyware, adware, browser hijackers, dialers, and other potentially unwanted software. It blocks spyware/tracking cookies in Internet Explorer and Mozilla/Firefox. It restricts the actions of potentially unwanted sites in Internet Explorer. 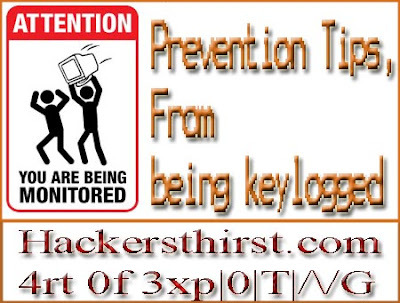 There is a simple way to do this, As most of the keyloggers can be terminated by using this method. Press ctrl+alt+delete and start task manager. Here come to processes, and kill down any miscellaneous activity shown there like server.exe or if you get there any name which sounds like keylogger related software in the description shown there. Then investigate and kill that process. Well all this depends upon you experience so, i,ll suggest using this Free Antivirus (Eset Smart Secuirity). We are giving this for free. Install it and whenever you will download a miscellaneous file it will detect it. You can also use KL-Detector. It will work by scanning your local hard disk for any log file created during the monitoring process. Most keyloggers will eventually save the recorded data into a location in the hard disk. KL-Detector will inform you of such log file. This way, the program can detect all keyloggers, both known and unknown. Use KL-Detector to detect keylogger in public computer before you enter your password, credit card info, etc also its quite handy too, You can take it any where.